The “deterioration” of the English Language? 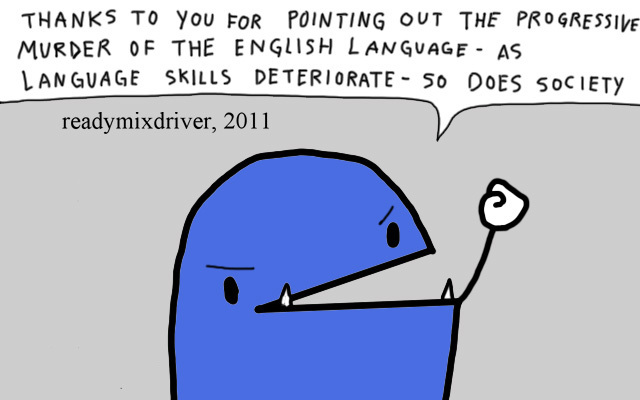 On my last post, there was a comment from “readymixdriver” lamenting the “deterioration” of the English language. While I understand the sentiment, I don’t necessarily agree with this. English has become the global language; there are hundreds of millions (if not billions) of people around the world learning it in some capacity. If you have a facility for the language, feel blessed. English is going to be just fine. This entry was posted in Other Comics! and tagged boggleton drive, English, funny, grammar, humour, jonathan swift, language, lol. Bookmark the permalink. 42 Responses to The “deterioration” of the English Language? Well played sir, very well played. I would lament the awful way in which people bludgeon my mother tongue more but I clearly don’t have a leg to stand on when I myself contort certain bon mots to fit my fancy. I’m sure you’ve worked hard on your language skills, while many people haven’t. Why wish for a level playing field? Enjoying your blog! Me love Boggleton Drive. No, wait, wrong post. What on earth is “eggys”? Honestly, I have no clue. Sometimes I feel like dyslexic people who can’t spell and don’t have spell checkers would have done fairly well with Middle English. If I’m not mistaken, eggys means eggs. 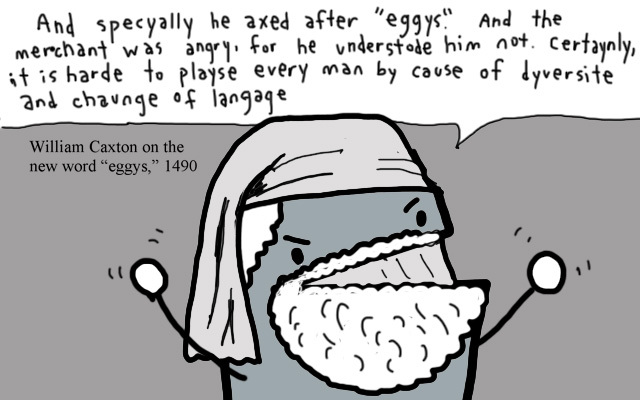 Caxton is talking about a story that a merchant from another village visited the town, and asked for “eggys”, but the local people did not understand what he meant by that (they thought the man was speaking French). You are a man of great good sense! If you don’t mind, I would like to quote this directly for all of eternity. Its strength is also its weakness. Because it is dynamic and adaptable, to suit our modern world, it is also corruptible. We donated it to the US. They gave us Steinbeck and McCullers but also Weinberger, Reagan and Bush. We have to learn to take the sublime with the ridiculous! 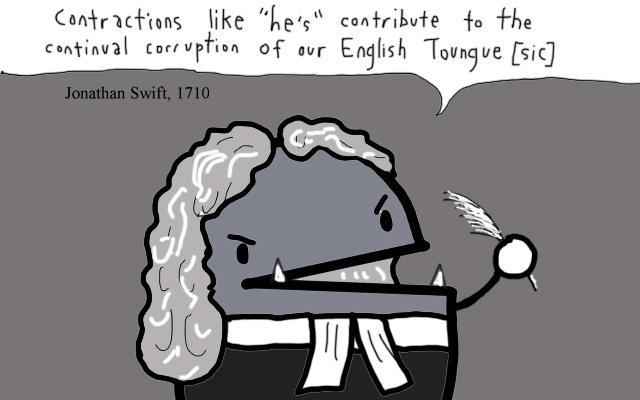 And for each country, there is some form of English that it can call its own. Here, the word salvage means “to execute extrajudicially.” So yeah, just sayin’. English has taken on so many forms that it’s just going to evolve in so many directions. Another funny and excellent post, Guru (yes, I shall call you that from now on)! What an honour! If only I could convince my friends and family to call me that. I think English is going to go the opposite route. Our world is smaller than ever, and access to media like the internet, film, and TV is likely going to level out some of the huge differences in regional slang and accents. And yes, I have no idea whether A. Tibbets was a fan of tie-dye, but my gut says yes. Our world is smaller than ever, and access to media like the internet, film, and TV is likely going to level out some of the huge differences in regional slang and accents. Ah yes, you have a point. But that gave way to a whole new language, though. I swear, YouTube comments are written in a language of its own, with just the right hints of vitriol and ignorance. I have just finished a book on the anglicisation of the German language and how this allegedly ‘desecrates’ the ‘purity’ of my mother tongue. Thankfully the authors come to the same conclusion as you: There always has been and always will be external (and internal) influx into a language that is spoken by millions, and even more so in times of internationalisation. So just relax, the language will be fine. Love your post, as always. Thanks for the insight and keep up the good work. Well said, as always… and very funny. I’m printing this one out and hanging it in my classroom (my students think I sound like one of those guys I’m sure). Thanks Kris! And hopefully they don’t take this as open season on English — There’s change, and then there’s butchery. I love your insights. Thanks for another great post! Word. Language is constantly evolving, and if it doesn’t, it dies. Reading anything in Middle English makes you quickly appreciate modern English again. I love the tie died shirt in the 70’s and how the pictures soon turned to black and white. LOVE IT! You and I would have gotten along well in school. I was one of the rare nerds who loved to diagram sentences. Love this. 🙂 Languages change, and it isn’t a bad thing (usually). This is the sort of English up with which I will not put! For reals, yo. 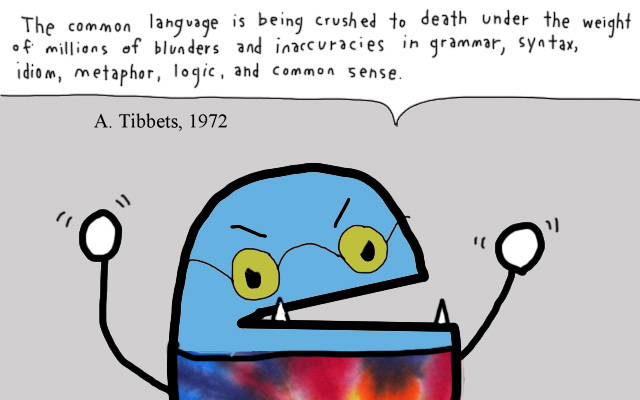 If languages didn’t “deteriorate”, we would still be speaking in caveman grunts. English will continue to morph and grow, and I have no complaint with this. While some folks will insist that we all adhere to a certain style of writing, grammar, punctuation, etc. (such as the Chicago Manual of Style that is touted by proofreaders and editors everywhere), there are certain “rules” that may be broken without fear of being beaten by a wet noodle. Websters adds new words to the dictionary every year (although I’m still on the fence when it comes to texting abbreviations [the same texting abbreviations I refuse to use if and when I choose to text (I like parenthetical asides, by the way)]). And as Mr. Caxton so kindly illustrates, had not the English language “deteriorated,” we would have an overabundance of Ys running amok in our blogs today. I sort of agree with the original comment of deterioration. I consider myself to be somewhat of a prescriptivist rather that a descriptivist (although this is probably a bad thing). have you heard of the apostrophe protection society? It’s very likely that fundamental rules of grammar such as that will shortly disappear purely because people don’t understand how to use them. I think that this time around, the issue is much more serious because of the internet and the poor grammar being spread more widely like a bad virus. Also, more people don’t understand basic rules of English than do, meaning that it’s only a matter of time. Perhaps, the claim that society will deteriorate because of language is a little extreme (hasn’t it already deteriorated anyway?) but there is truth in the decay of language. I’m probably wrong, and I’m open to a debate (which you’ll undoubtedly win) but that’s just the way I feel about it :>. I was just like D:! It’s the most logical thing in the English language, really. Anyway, that’s my blather over and done with. Lovely post 😀 I always enjoy reading your posts, even if we don’t necessarily agree! In my opinion, there is a clear difference between typing LOL and bad grammar. LOL, along with BRB, TTYL, and many others, are abbreviations not grammar mistakes. They can actually get quite inventive, and can be great time savers. While I ultimately detest bad grammar, save for certain situations (funny ones), I can tolerate abbreviations due to their creativity and convenience. Ah, I have no qualms with abbreviations for the most part. I think that if you can avoid using them, you should do so, purely because they can look somewhat shabby depending on the context. I meant that the internet exacerbates it because of other grammatical issues like the evident confusion between ‘your’ and ‘you’re’ as well as ‘its’ and ‘it’s’ and so on. 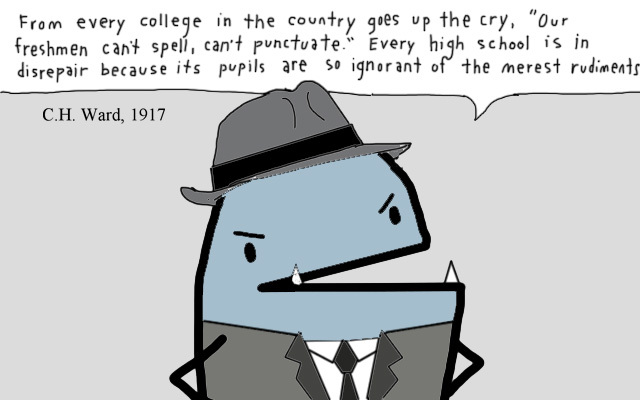 :> I’m all for bad grammar used in irony to make a point, but that’s about it :>. Agreed. I like your about page, do you have a blog? Thanks, olletron. Yes, it does seem like the average person’s writing skills are fairly awful nowadays, but I don’t think there’s need to worry. Being a strict prescriptivist is limiting, I think (How about Dickens comma-splicing the crap out of the first paragraph in (arguably) his greatest work? And James Joyce’s editor’s head would have blown clean off if he were a prescriptivist). The English language will, indeed, be fine and I agree about “deterioration” not necessarily deserving the negative connotation. Look at what a little country at the bottom of the world is starting (http://www.usatoday.com/news/offbeat/2006-11-13-text-speak_x.htm). It may seem like things are “deteriorating” rapidly (especially once the Americans got hold of it, @wobsy) but check this out (http://www.princeton.edu/~browning/decline.html) – “The earliest language “crisis” … occurred in ancient Sumeria”. This terrific post comes to you from Matthew Baines over at Boggleton Drive. Enjoy! Me and him agrees wit jew.